UNAMA recorded 3,062 child casualties (927 deaths and 2,135 injured). While this was a slight decrease compared to 2017, child deaths [alone] reached record high levels in 2018, mainly due to the more than doubling of child deaths from aerial operations, as well as an increase in child deaths from suicide attacks. U.N. officials identified the terrorists, or Anti-Government Elements (AGEs), like the Taliban and the Islamic State’s Afghan wing (ISKP) as the top perpetrators, responsible for more than 60 percent of all civilians casualties, including those involving children. Pro-Government Forces caused 24 percent of civilian casualties — 14 percent by Afghan national security forces, six percent by international military forces, as well as four percent by other pro-Government armed groups and forces. Compared to other perpetrators — including ISIS, the Afghan security forces, and U.S.-NATO-led coalition airstrikes — the U.N. identified the Taliban and its improvised explosive devices (IEDs) as the top civilian killer last year. UNAMA attributed 4,072 civilian casualties (1,348 deaths and 2,724 injured) to Taliban, a seven percent decrease compared with 2017, comprising 37 per cent of all civilian casualties. UNAMA attributed 2,181 civilian casualties (681 deaths and 1,500 injured) to Daesh/ISKP, an increase of 118 percent compared to 2017, comprising 20 percent of all civilian casualties. UNAMA attributed 678 civilian casualties (196 deaths and 482 injured) to undetermined Anti-Government Elements. Civilian casualties by terrorists “mainly resulted from the indiscriminate use of suicide improvised explosive devices (IEDs) and the deliberate targeting of civilians with these devices,” the international body pointed out. “Anti-Government Elements’ use of IEDs in both suicide and non-suicide attacks reached extreme levels and remained the leading cause of civilian casualties in 2018, accounting for 42 percent of the total,” the U.N. determined. Terrorist attacks caused nearly 45 percent (324 deaths and 1,019 injuries) of all child casualties, more than any other perpetrator including pro-Kabul aerial operations (414 deaths and 637 injured). However, the number of child fatalities alone caused by aerial operations, including those carried out by the U.S.-NATO coalition did exceed those stemming from terrorist attacks. Last year, the U.S. military dropped 7,362 bombs on jihadis in Afghanistan, more than during any other time in at least the last decade, the latest U.S. Air Forces Central Command airpower statistics summary revealed. The U.N. documented a record number of civilians casualties (536 deaths, 479 injuries) at the hands of U.S.-NATO and Afghan air force airstrikes. 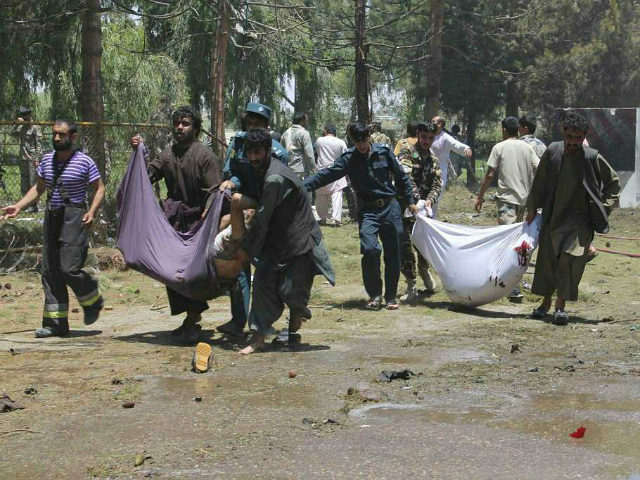 However, the total number of casualties (6,980) perpetrated by terrorists, primarily the Taliban, dwarf those figures. In recent months, U.S. President Donald Trump’s administration has intensified peace negotiations with the Taliban to end the more than 17-year-old war in Afghanistan. The Trump administration deemed the reconciliation between the Afghan government and the Taliban the primary tenet of its strategy to end the conflict, released in 2017. U.S. officials have been meeting with the Taliban since at least July 2018.